Wood’s Mobile Glass has the experience and parts to properly replace your vehicle’s glass. Auto glass is a critical component to the structural integrity of your vehicle, and a quality installation is important for your safety. We offer same day service in most cases and can service your vehicle almost anywhere in Central Virginia, the Greater Richmond area, the Middle Peninsula, and points beyond. We repair or replace auto glass for front windshields and rear glass, as well as side windows on cars, trucks, SUV’s, tractor trailers, farm equipment, motorcycles, and more. 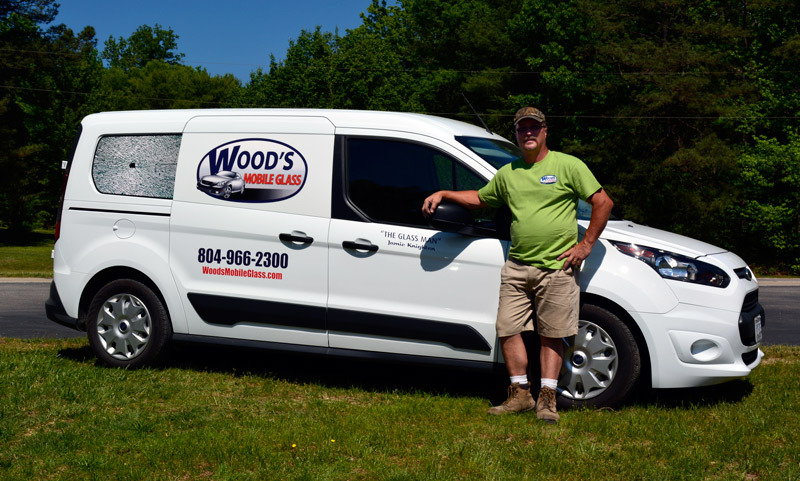 Wood’s Mobile Glass is licensed and insured, and locally owned and operated. We have 27+ years experience in New Kent County, and are known for our trustworthiness. We use OEM or equivalent replacement glass on all repairs. We offer convenient and quick turnaround times. We offer a lifetime warranty for leaks, stress cracks, and defects on our auto glass. Monday-Friday: 8:30 AM-5:30 PM; Evenings and Saturday by appointment only. We can also work with your insurance company.